1G Acceleration for 1 year. 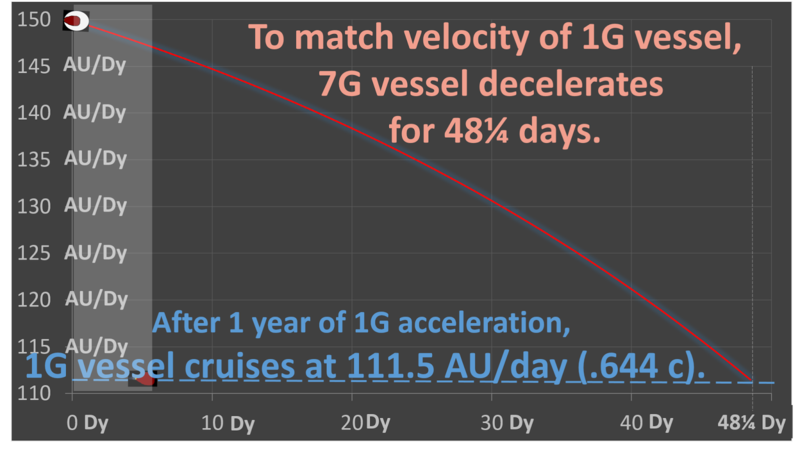 7G Acceleration for 100 days. 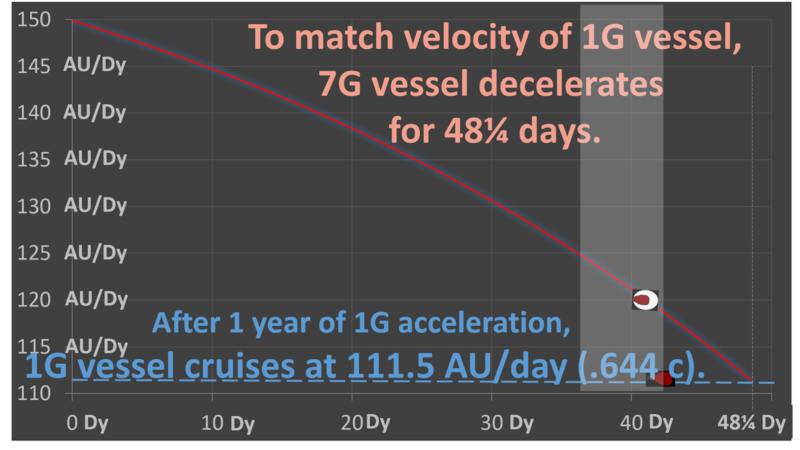 7G Deceleration for 48¼ days. 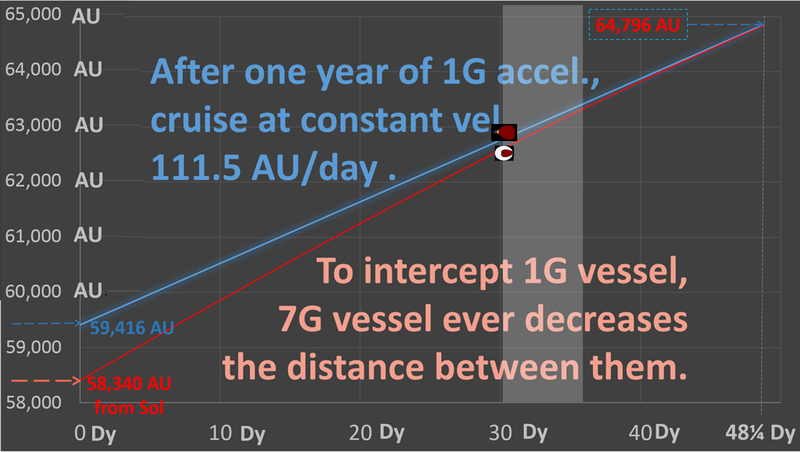 1G Deceleration for 1 year. 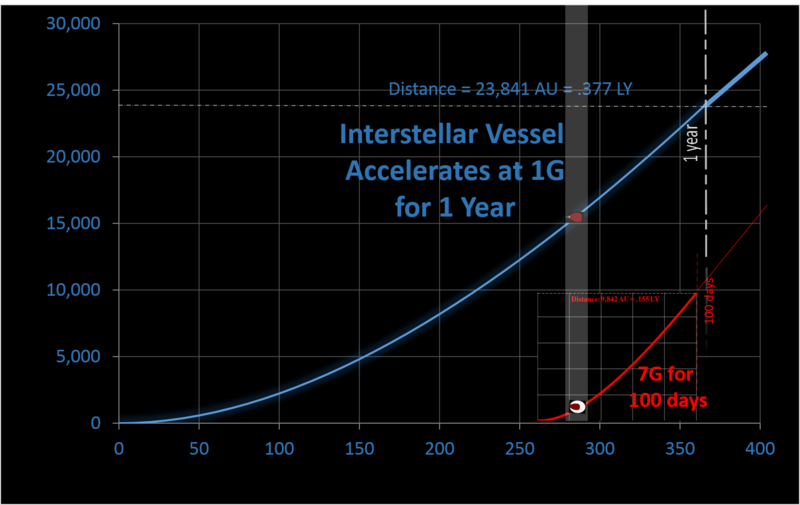 Assume exhaust particle speed = .99c. 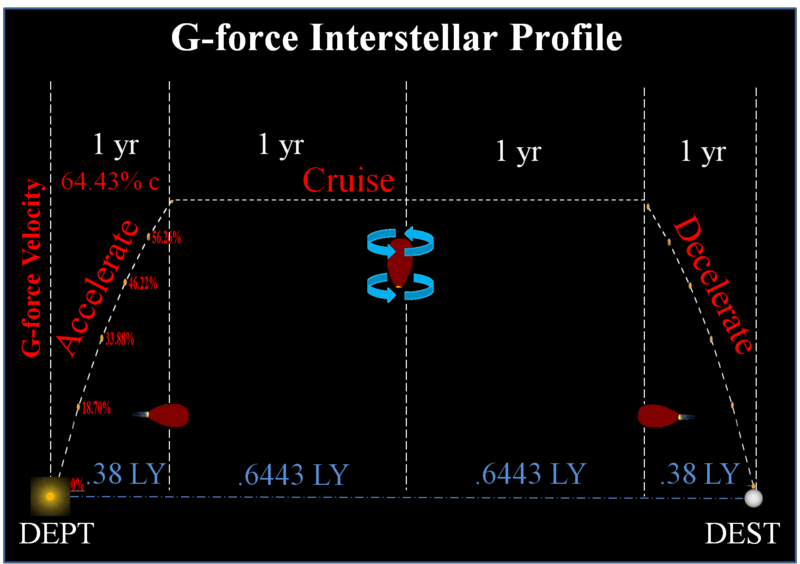 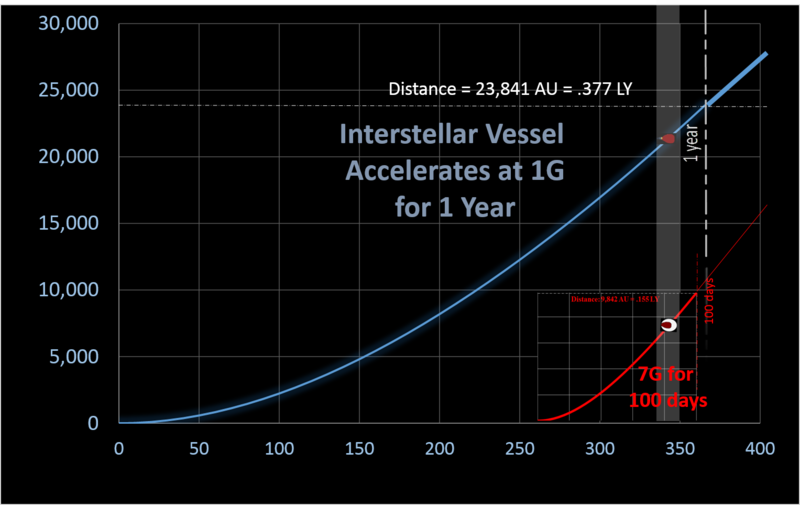 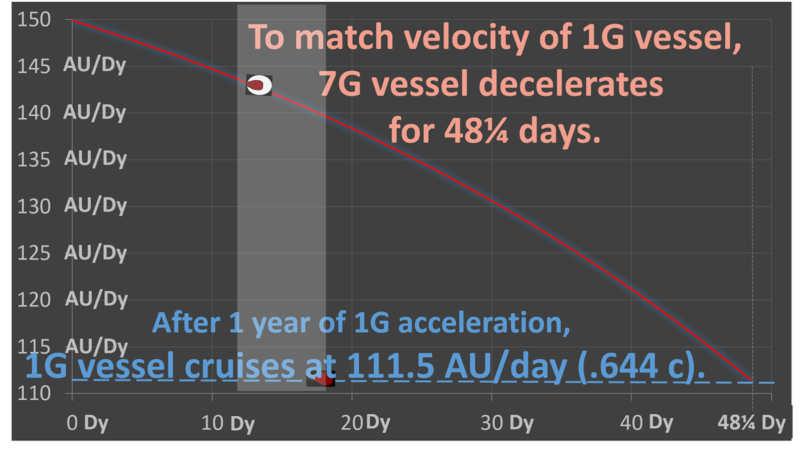 Thus, exhaust flow, ∇=0.0356% ship's GW/day, is needed for 1G acceleration. 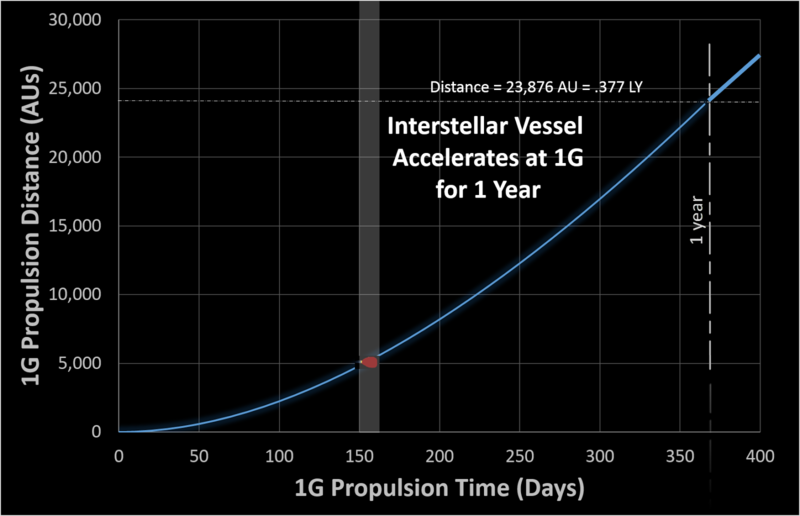 to compensate for inevitable inefficiencies. 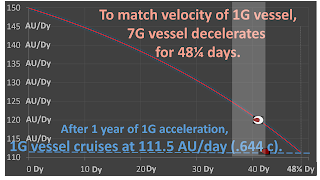 Daily fuel consumption rate = ε∇ =0.000485; or .0485% GW/day. 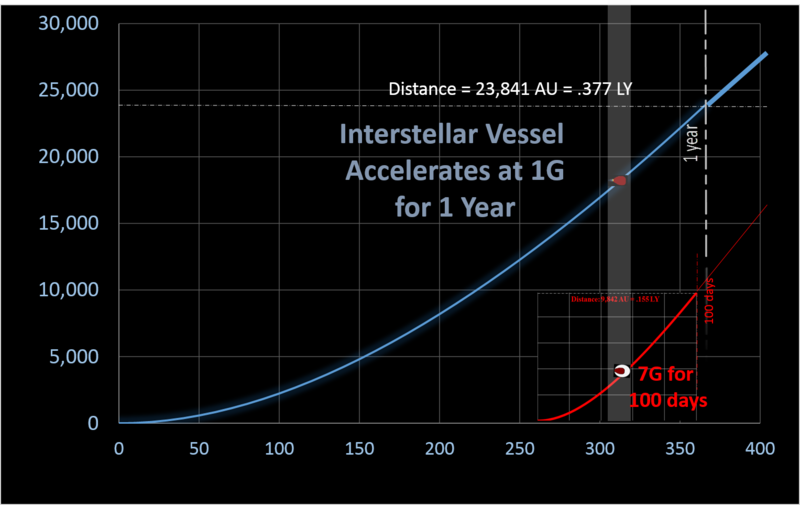 1-ε∇ = 0.99951 = daily Remainder of ship's GW. 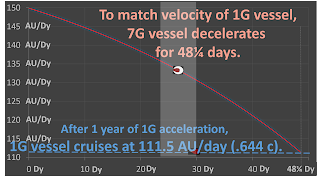 Thus, exhaust flow, ∇= 0.2492% ship's GW/day, is needed for 7G acceleration. 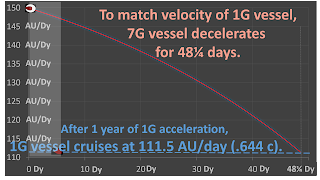 Daily fuel consumption rate = ε∇ =0.003394; or .3394% GW/day. 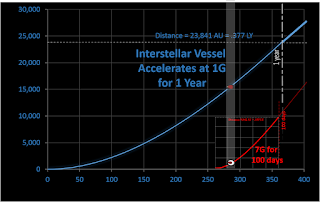 1-ε∇ = 0.9966 = daily Remainder of ship's GW. at exactly the time/distance of the intercept. 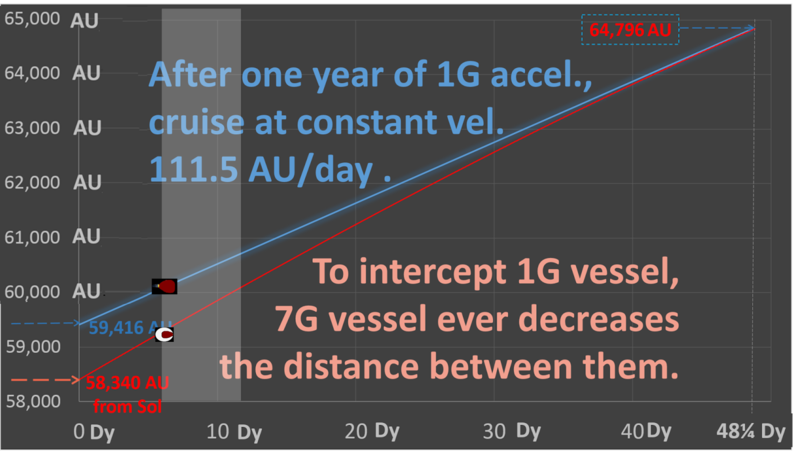 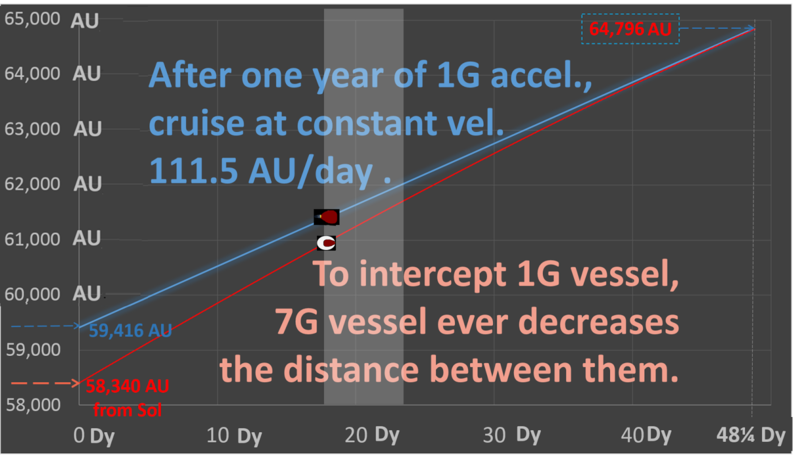 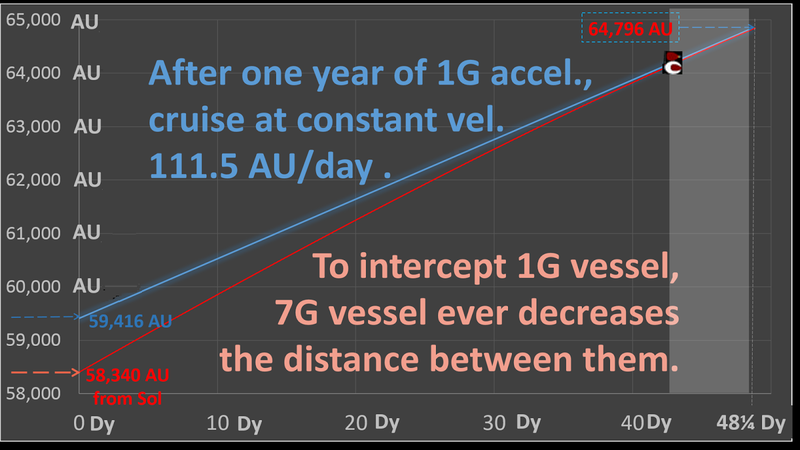 0 days To maintain "equivalence", trip's 1G deceleration must be same duration as initial 1G acceleration; EXAMPLE: 1 Year. 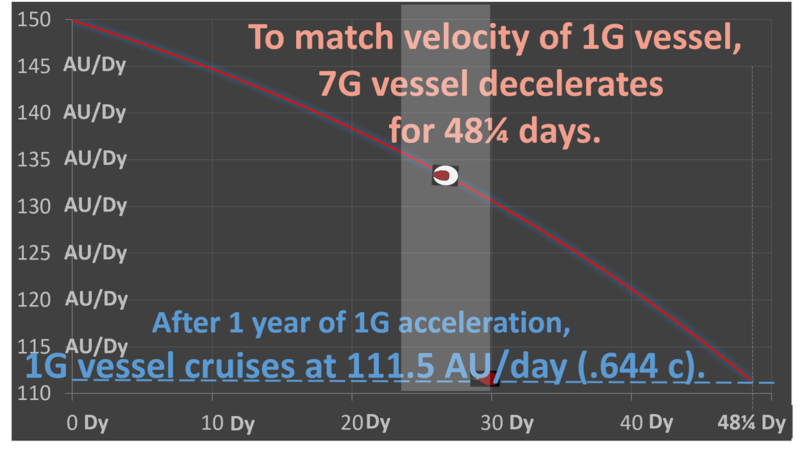 2 days 111¼ AU/dy "Spot Velocity" for deceleration uses same "Einsteinian" formula as for acceleration. 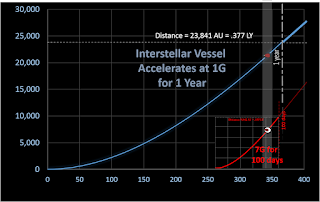 However, decelerated velocities require "reverse order" computation; thus, use "365¼-t" as exponential. 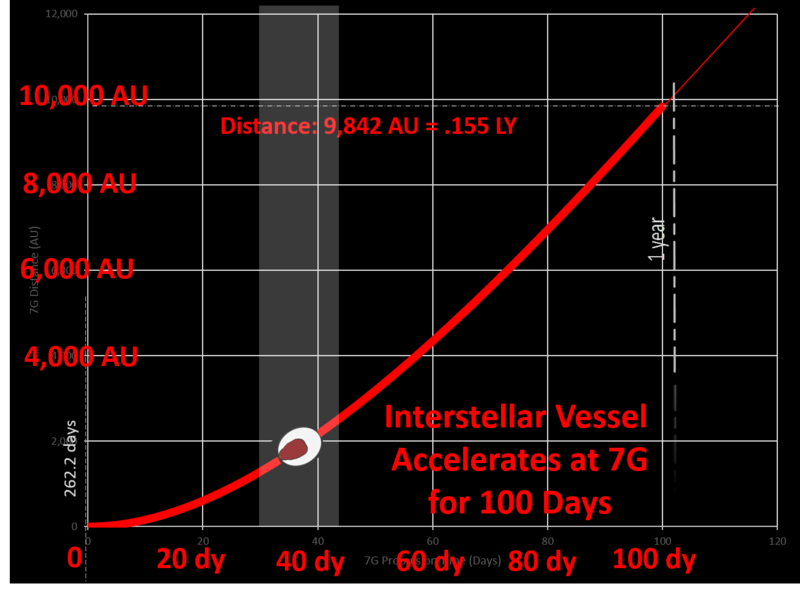 4 days 110.90 AU/dy 64.05% c Convert from Astro Units per day (AU/day) to % light speed (c). 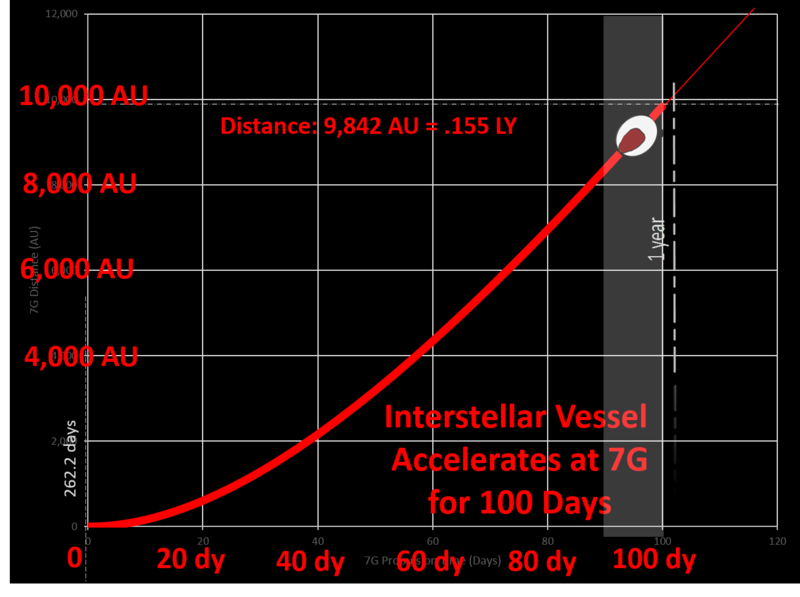 IDENTITY: c = 173.145 AU/day. 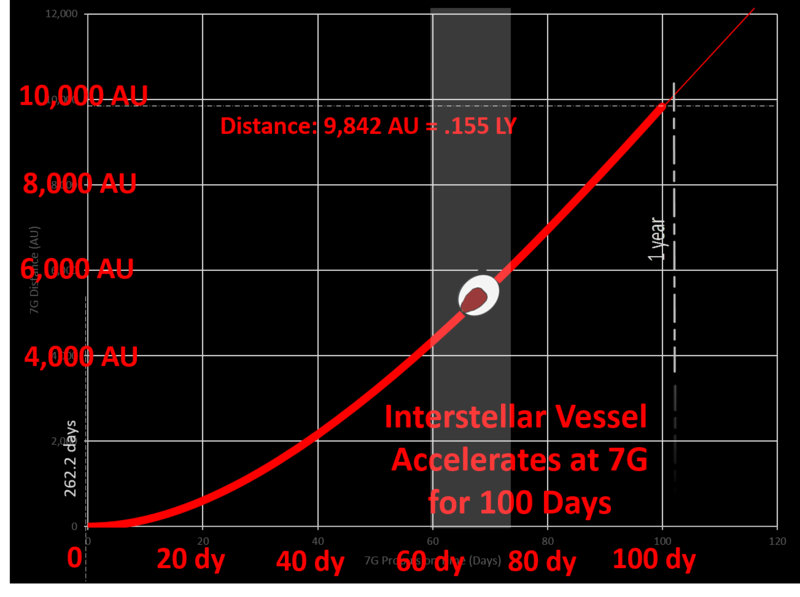 EXAMPLE: Value = 110.72 AU/dy × c/173.145 AU/dy = .6395 c = 63.95% c.
6 days 110.55 AU/dy 63.85% c 23,277.0 AU Uses same "Einsteinian" formula as for acceleration. 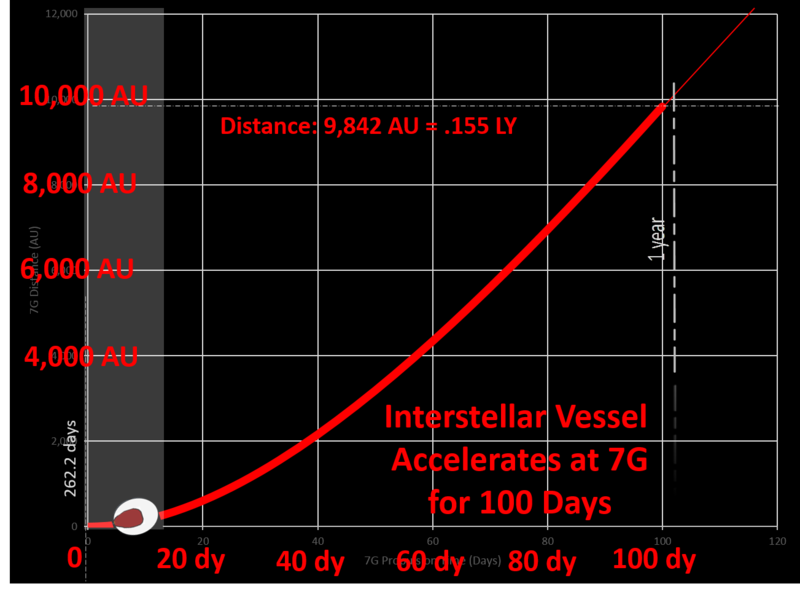 Deceleration leads to shrinking distances which countdown to 0 AUs. 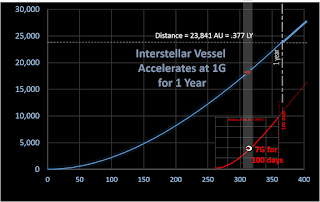 total consumption is 15.716% GW0. 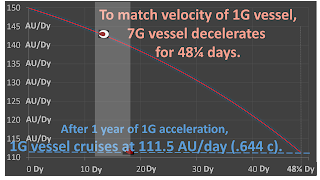 counts up from 0 to 15.716% GW0.